Many hydrological, geochemical, and biological processes associated with water reclamation and reuse are poorly understood. In particular, the occurrence and effects of trace organic and inorganic contaminants commonly found in reclaimed water necessitates careful analysis and treatment prior to safe reuse. 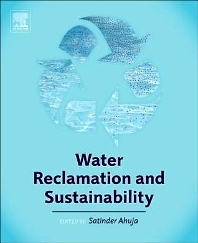 Water Reclamation and Sustainability is a practical guide to the latest water reclamation, recycling, and reuse theory and practice. From water quality criteria and regulations to advanced techniques and implementation issues, this book offers scientists a toolkit for developing safe and successful reuse strategies. With a focus on specific contaminant removal techniques, this book comprehensively covers the full range of potential inorganic/organic contaminating compounds and highlights proven remediation methods. Socioeconomic implications related to current and future water shortages are also addressed, underscoring the many positive benefits of sustainable water resource management.